Sonos reminds Apple who’s boss! To pre-empt the launch of the new Apple HomePod, Sonos is offering a limited deal on its new Sonos One smart speakers that work with Amazon Alexa. This deal is almost a no-brainer for anyone in the market to buy a small wifi speaker. 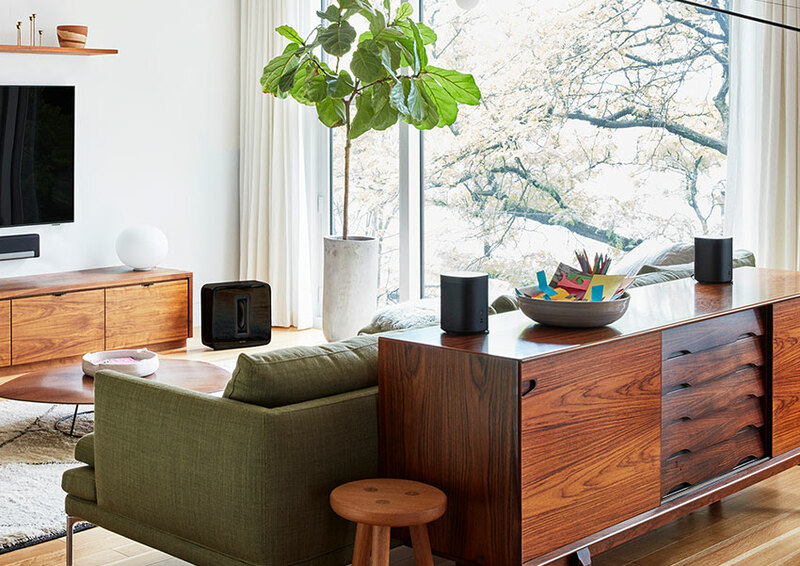 Sonos are current market leaders, have great support for a range of streaming services such as Spotify, and now you can purchase two Sonos Ones for the price of one Apple HomePod at £349. This will allow you to pair the speakers together for a stereo set or put the second one in a different room and use Sonos multi-room configuration via its App – neither of which you can do with the Apple HomePod. For those of you unfamiliar with Sonos, they were one of the first brands to offer a multi-room speaker system and have a range of products that allow you to send music direct to your current music setup. They also have a range of speakers with the Sonos One being the smallest of the bunch, followed by the Play 3 and the Play 5. The Sonos One is a mono speaker with 2 speakers inside; one tweeter and a mid-woofer which is designed to provide faithful playback of mid-range vocal frequencies and give deep, rich bass. It has an incredible sound and can go pretty loud without distortion. It also has 6 microphones which are used to calibrate the sound to the room upon initial set up. The mics are also used to cancel noise and help with hearing your Alexa commands. The Sonos One’s main selling point is its integration with Amazon Alexa. You will immediately notice the difference in quality from using Alexa with Sonos if you are used to using one of Amazon’s own devices such as the echo. Sonos is also working on a future release to support Google Assistant. I’ve no doubt that once the Google Assistant update goes out this will be the best smart speaker on the market. Currently, the Sonos One is rated as the best wifi speaker for £200 or under and was quick to knock the Bose range of speakers from the top spot a few years ago. Whilst the quality of the Apple HomePod is unknown, its safe to say that it will be locked into the Apple eco-system. Sonos has the advantage of supporting all platforms and its app is very well established. This means that, if you change your mind down the line, you are not left with a dormant HiFi system locked into an eco-system you no longer use. Kudos to Sonos for taking advantage of the Apple HomePod release date and offering this deal. Sonos really is one of those brands where once you start using their products, you wonder how you managed to live without them beforehand.